Gumbo & Bingo – Social Bridges Inc.
LeBrane’s Creole Cuisine is a long time vision of Carol Marie LeBrane and Chef Myron LeBrane Jr. Carol has been in the restaurant industry for 18 years, starting at a simple sandwich shop knowing that one day she could achieve the same thing. She has some formal culinary education to pair with her on hand experience from front of the house as a cashier/hostess, to line cook, to management. Carol LeBrane has a vision to give back to the community; she took that drive and passion to accomplish a Bachelor’s Degree of Social Work from Southern University at New Orleans. In 2014 she married Chef Myron LeBrane Jr. whom has a passion for family, food, and Southern tradition that matched her own. Chef Myron has 20 years’ culinary experience. His love for cooking began at the age of four years old while stirring roux for his grandfather whom ran a catering business. 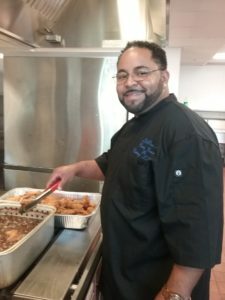 Myron began formal culinary training while still in high school and went on to head up kitchens in Margarita Ville, Pigeons Catering, and Ketchup Restaurant in Maryland just to name a few.In 2015 LeBrane’s Creole Cuisine was launched in their small kitchen.